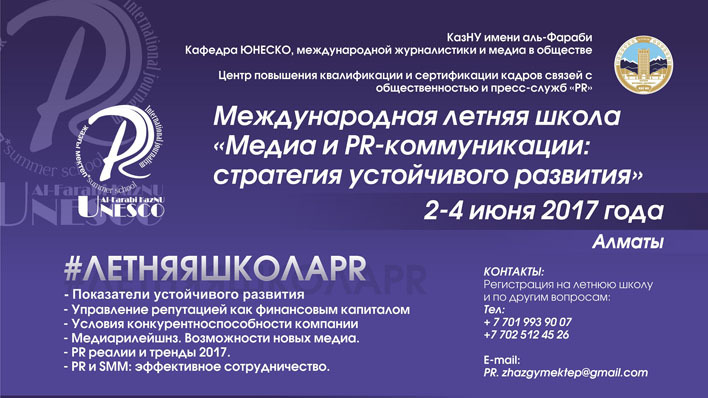 Al-Farabi Kazakh National University, the Faculty of Journalism, UNESCO Chair on Journalism and Media in Society, the Center for Advanced Training and Certification of Public Relations Staff and PR Press Services with the support of the UNESCO Cluster Office in Almaty, from 2 to 4 June 2017, conduct II International Summer School "Media and PR communications: sustainable development strategy". UNESCO Almaty Office will present a vision for communication to contribute to achievement of the sustainable development goals until 2030, with a special focus on goal 16, Peace, Justice and Effective Institutions. The program of the Summer School includes lectures, decisions, individual and group practical exercises, presentations, discussions based on the studied materials, critical analysis of real projects, individual consultations on a wide range of modern communication technologies, including: media content creation, the features of network communication and sustainable development of local media outlets. The classes are conducted by experts and media trainers in the field of communication and PR, editors-in-chief and experienced journalists of leading mass media, foreign and domestic professors from Kazak Newspaper LLP, Columbia University, AFC Communications, Alma-TV, Turkic Speaking Journalists Public Foundation, Center for the Support of Kazakh Speaking Journalists Minber Public Foundation, International Fund for the Protection of Freedom of Speech Adil Soz, JSC Kaspi Bank, newspaper Zan, Ulan newspaper, magazine Gulstan, Zhurgenov Kazakh National Academy of Arts, Manifestum Agency, JSC Kcell, JSC Development Center of Almaty, studio Zero To One Labs, Astana Banki, Air Astana, Al-Farabi KazNU. After graduation, the School provides certificates and recommendations for internships in editorial offices and public relations agencies of Almaty. The date of carrying out: June 2-4, 2017. Beginning: June 2, at 10.00, 409 room, 4th floor.